We have what some would call morning chores and evening chores, but we don’t call them chores. 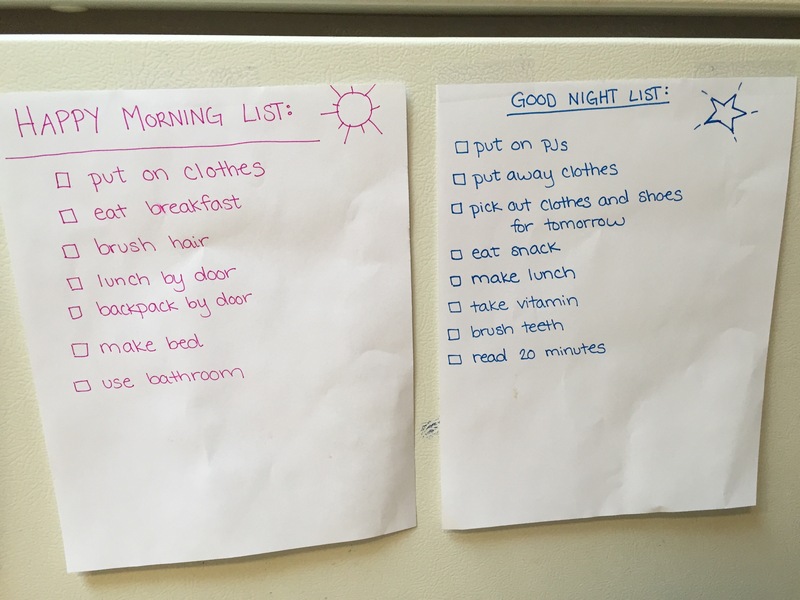 We listed our tasks and named them “Happy Morning List” and “Good Night List”. I believe in making things simple and fun. Sometimes reframing chores as a happy morning routine is all you need to help change your mindset and attitude. These titles reflect my overarching goal and the reason we are doing these tasks: we want to have happy mornings and good nights. So far, it’s worked! My kindergartener and I pick out clothes together and sometimes race. We make lunches together and brush our teeth together. By syncing our routines, we actually spend more time together in the evenings – an unexpected and welcome impact of these simple check lists. Now that I hold myself to the same standards of my kindergartener, my mornings have improved and my work day too! I wake up with my clothes ready and my lunch made, and I love having happy mornings and good nights.